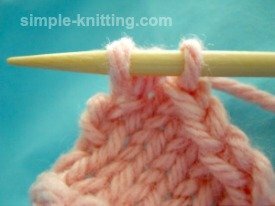 I've got a couple of bind off knitting tips to pass on to you today. 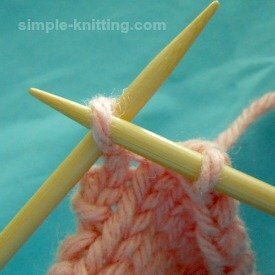 I thought it would be a good idea to give you a few more knitting tips specifically binding off stitches. These will help you finish knitting your project successfully. 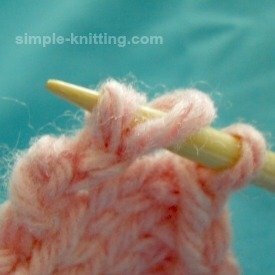 Many knitters, me included, tend to cast off knitting stitches way too tightly and when that happens you lose the stretchiness in your knitting. See in the photo below how the bind off row is kind of curly and curved upward and then there's that last loopy stitch at the end. It just doesn't look very good. But the good news is, with a couple of very simple bind off knitting tips you'll be able to make your bind offs look great. 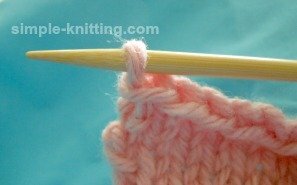 For the bind off row, try using a knitting needle that is 1 or 2 times larger than you used for the body of your knitting. This can really help keep those stitches looser and the finished edge will look more even and all the stitches will nice. 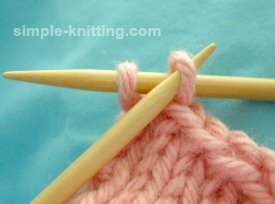 When you cast off in knit or purl whatever the case may be, don't tension the yarn at all and keep it very loose, almost sloppy like. This is the one time that you can do this. I know it sounds a little off the wall but give it a try. After you cast off about half the stitches stop and have a look at what it looks like. You may be very surprised that they look perfectly fine. I couldn't believe it the first time I tried it. My bind off row actually looked really well done. That extra loose tension gives the stitches more room and your bind off won't be so tight. 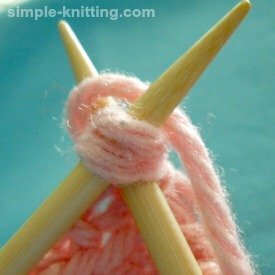 So try to let the yarn flow through your fingers without applying any tension at all. That way the stitches pretty much fall where they should and they won't curl. 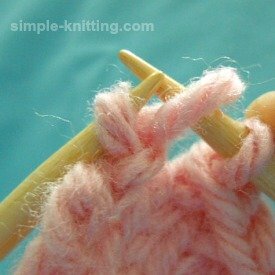 The best way to try these bind off knitting tips is to practice so pull out some yarn and needles. Cast on about 15 - 20 stitches and knit for about 1 - 2 inches. Then, using a bigger knitting needle, bind off the stitches and see how it looks. Remember you can go up 1 or 2 sizes so see which works best. 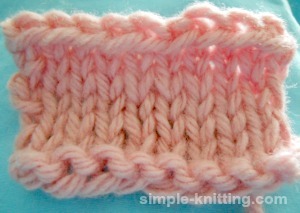 Then try the same swatch test only cast off stitches very, very loosely and see how it turns out. Sometimes that last stitch just doesn't seem to lie right and it always seems a little looser than the others. Sometimes it just looks wonky. So give the instructions below a try. 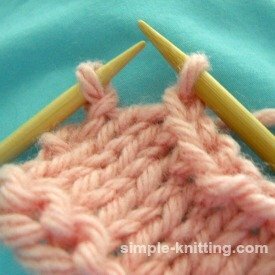 You are down to the last two stitches on your needles with one stitch on the right and one on the left. With your right needle slip the last stitch from the left needle over to the right. There are 2 stitches on right needle. I turned my needle around a bit so that you can see. 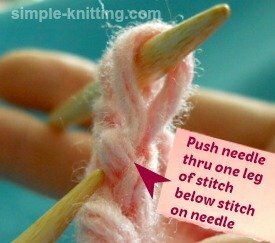 What you will do is stick you needle into one leg of the stitch below the stitch on the needle. Lift that leg onto the right needle just like the photo. Now all you do is knit them together. Now you have 2 stitches left on your needle again. Bind these two stitches off normally. So slip left needle into second stitch and pass it over the first stitch. 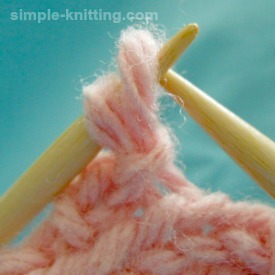 When you have the last stitch on your needle, cut your yarn and bring the yarn through the last stitch and pull snugly. Looks cool right? Oh I know if you see on the right side I did make one stitch looser than the rest (by accident) but you get the point right? It's even and it doesn't look loopy and wonky. Ha, the fact that I actually have a loose bind off stitch is pretty cool for me. Yippee. See how much better everything looks when the bind off is done loosely? It's really dramatic especially when you're working on a sweater or scarf. 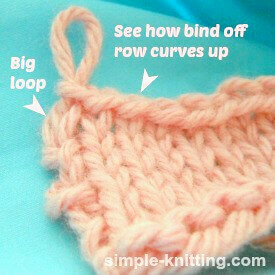 I hope these bind off knitting tips help you.